Well hello to you my reader chums! As Autumn has now arrived, it's that time of year where all the cosy activities begin and the run up to Christmas commences. Autumn has to be one of my favourite seasons because it's the transition from summer to winter, a time when long days turn into long nights and it becomes a season to experiment with layering fashion, combining a series of darker colours. I love how evenings can be spent tucked up with a good book and hot chocolate or film nights with friends, cosied up in onesies or blankets. The vibe is simply heart-warming, with the nogalistic Christmas preparations starting and the random adventures this season takes us on. Not the Saturday just gone but the week before I had one of those weekends that was so cherish-able it was something to document on my blog. Even though I see my best friends on a very regular basis ( I work with Chloe and see Danielle a couple of times a week), there's not many occasions where I can just spent the entire weekend purely with them both. This weekend was clearly an exception because we were able to, spontaneously spend some quality time together. On the Saturday we headed up to one of our local shopping areas to look around the shops and see a food festival they had on. During the route home we decided to head to one of our local pubs for a couple of drinks and some food, this however didn't go to plan. We ended up staying there the whole night, having a whale of a time/laugh, meeting new people and chatting the evening away. Since it got so late, we ended up all going back to Danielle's place, having a hilarious sleepover just like the sleepover club, sharing a double bed! Considering we were extremely giggly at this point, we took several pictures, chatted and then fell asleep. The following day led to us going home and meeting up later to see the incredibly sad 'Miss you already film', a perfect choice for a movie with your best chums. 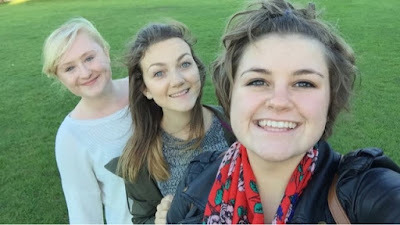 Once we'd been emotionally drained (we were all in floods of tears), we walked from the cinema home, taking a nature route, talking away about the most random things, conker hunting and generally just having a fab giggle. Spending such spontaneous fun with my two best friends was such a treasure. I'm so blessed to have these two in my life, bringing endless amounts of happiness and warming my heart always. True friendship is pretty hard to find as the best ones are already mine. These two support me through everything, continuously make me smile, helping mold me into who I am today and I genuinely couldn't thank them enough. Friendship is an aspect needed to remind you that life can truly be great, unforgettable memories are made possible into future stories to tell. 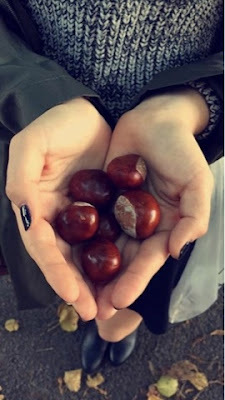 To fully appreciate the autumnal atmosphere, a picture of collecting conkers with leaves all around was rather expected. Even though only a few pictures were captured, they've become some of my favourite images of us as a trio. Experiencing moments of genuine happiness, laughter and love for one another is rare. Looking back on these times makes me so thankful to have the best friends I do, sharing such fun adventures together. I hope you enjoyed this lifestyle type post. What do you like best about autumn?